In this legal podcast, Jill Blumberg, Brenda Cooper, and Lori Smith speak as real estate attorneys about the complexities of drafting joint venture agreements. Real estate law can involve a lot of moving parts that are complicated to maintain. In this episode of Thomson Reuters: Down the Hall with Practical Law, host Craig Vaughn along with guests Jill Blumberg, Brenda Cooper, and Lori Smith speak as real estate attorneys about the complexities of drafting joint venture agreements and balancing the needs of both investors and developers. They also discuss the different aspects of being a real estate attorney in a joint venture transaction and the art of juggling various disciplines for this type of project. Jill Blumberg joined Practical Law from Hunton & Williams LLP, where she was a senior attorney in the real estate department focusing on commercial real estate matters. Previously, she was an in-house attorney and the Head of Equity Closings at New York Life Investments. Jill’s practice focused primarily on acquisitions, sales and development of large investment properties and she has in-depth experience structuring and drafting complex real estate joint ventures. Brenda Cooper joined Practical Law from Metropolitan Life Insurance Company, where she was assistant general counsel in the Real Estate Unit of the Investments Department. Brenda was responsible for managing some of its largest real estate joint venture relationships as well as handling sophisticated debt and equity real estate transactions. Lori Smith joined Practical Law from Andrews Kurth LLP, where she was a partner in the business transactions group. Lori handled many real estate joint ventures, representing developers and investors (as well as lenders) in structuring and documenting deals for multi-family, mixed-use, and assisted living projects. 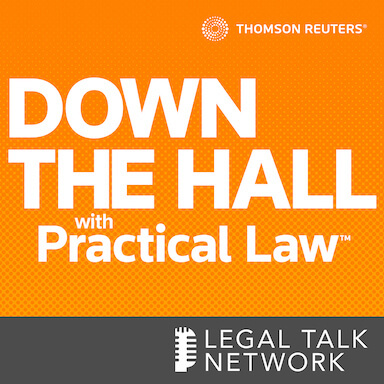 Intro: Welcome to Thomson Reuters: Down the Hall with Practical Law, the show that provides practical insights and expert know-how in trending legal issues. No legalese, just expertise, with you host, Craig Vaughn. Craig Vaughn: Our panel consists of senior legal editors on the real estate team, each with over 15 years of experience. Jill Blumberg worked in both large firms in Manhattan as well as in-house at a large full-service mutual life insurance company, helping to develop their equity investment platform. Jill’s practice focused primarily on acquisitions, sales and development of large investment properties and she has in-depth experience structuring and drafting complex real estate joint ventures. Lori Smith was a partner at a large firm and had a diverse real estate practice. Like Jill, she handled many real estate joint ventures, representing developers and investors, as well as lenders in structuring and documenting deals for multi-family, mixed-use and assisted living projects. Brenda Cooper worked in private practice in New York City and in-house at a global financial institution where she worked on debt and equity, real estate transactions and was responsible for managing its largest real estate joint venture relationships. So welcome everyone to the team. We really appreciate you being here. Let me ask you this, how is drafting a joint venture agreement different from drafting a more straightforward real estate agreement? Brenda Cooper: Thanks Craig. This is Brenda Cooper. I will start by saying that when you are entering into a real estate joint venture, it’s a business partnership that can last for an extended period of time, sometimes 10 years or more. And each party may be going into it with a different business motivation or risk tolerance. So the question becomes how do you make sure their incentives become more aligned? If they don’t have the same investment strategy going into the venture, there’s a greater chance for disputes between the partners during the life of the investment. So there is a need to provide effective exit strategies and dispute resolution mechanisms on day one, which are two of many key areas of negotiation in a JV agreement and can be very complicated negotiations. It’s also important that the parties go into the deal with their eyes open to the potential risks involved, both near and long-term and negotiate protections for unforeseeable circumstances that can occur far down the road. For example, joint ventures are often formed for ground up development between an operating member, who doesn’t have much equity, but has real estate expertise, and an investment member who provides most of the capital. These development deals are highly risky and complex and they require a lot of upfront due diligence to understand the risks involved and the structure around them. So the terms of the joint venture help address these important goals when you are entering into the joint venture, to align the party’s incentives, to protect against unanticipated consequences, to provide controls over the management of the venture, and for effective exit strategies and dispute resolution, these are number of ways that they are very complicated and require a lot of expertise from the lawyers to help advise their clients. Lori Smith: Right. And this is Lori Smith. I would just piggyback onto that, the difference really is that the real estate joint venture agreements are so business term driven, the business deal impacts the drafting and it informs the legal advice. There are many permutations and for these kinds of transactions where you have the investor member and the operating member and the various interests, one size doesn’t fit all. You could do 20 different deals with none of them looking the same. Even deals where you might have the same investor but because the relationship with the operating member is different, even that specific investors’ deals, even the joint venture agreements that that party is going to enter into is going to be different. Every deal is so unique based on those business terms and based on trying to document and get into the agreement all of the risk tolerance and the incentives and all of those things that Brenda was just talking about. Jill Blumberg: Hi. This is Jill Blumberg. And as both Brenda and Lori have already said, there are so many different things, so many different factors that go into drafting and negotiating these JV agreements. Even taking a step back and looking at it from a very macro level, at the very beginning when the parties are coming together and deciding how they are going to structure their deal, what the deal is going to look like, there are a lot of tax implications, both on the federal and the state level that might influence how they structure the deal. There are financing implications. It depends on what kind of deal it is, whether you are getting construction financing, whether there’s going to be mezz financing, whether one party already owns the property or whether they are buying the property with acquisition financing, all of those types of implications really go into how the JV is structured and then negotiated. In addition to that, besides just having the parties that are involved in the joint venture transaction themselves, if you do have financing and there are outside lenders, the lenders are going to have a vested interest in what that joint venture looks like and what the deal terms are of that joint venture. So there are going to be lender requirements that the parties have to consider when structuring and negotiating their deals. And then just if you want to add one more layer, with the huge influx of foreign money that’s now coming into the US and into US real estate so many joint venture deals have foreign investors and those foreign investors, while they bring their money, which is great, they also bring a whole host of other considerations that the parties and the lawyers really have to consider when accepting foreign money from foreign investors. And then if you want to know on top of all of that, you have to look at what’s happening in the overall market, both nationally and then in the market where your project is located. So as Lori had said, all of these deals are so business term driven that really what’s going on in the overall market will very often influence and determine which party has the leverage, whether it’s the investor who is bringing the capital or whether it’s the operating member who might have an inside sort of take on what’s going on in the market where the project is located. Craig Vaughn: Wow. So you have got long-term, high stakes deals, potentially a lot of disputes, these are sophisticated and bespoke, so I can’t really use my previous work product as much as I would like to. Thank you very much for talking me out of pursuing exploring a career in real estate joint ventures. I really appreciate that. It’s clear that these are really sophisticated. One thing that you point out being that this is really business or market-driven and not really based on law, when you have two parties, where you have the developer with the real estate experience and then you have the investor who is throwing in most of the cash, how do you balance that between the two parties? Brenda Cooper: Well, I think you have picked up on exactly the right term there and it’s balance. You really do have to assess the needs of both parties and come up with a solution that makes sense. One area where this is particularly the case is when talking about management. You have this operating member who is responsible for just that, operations. This, as we mentioned is the — this is the member with the development and the operations expertise, but usually doesn’t make a significant financial investment. So this operating member needs that ability to run the day-to-day business without constant interruption from anyone including the investor. But on the flip side, the investor wants some level of control because realistically it’s their money that’s at stake. So where’s the balance? The extent of control that an operating member is willing to give an investor and the amount that an investor is going to require really depends on the parties themselves, their businesses and importantly whether they have an existing relationship, does this operator have a good track record with this investor, and if they haven’t worked together, does this operating member have a good track record in the industry. Common ground in a JV agreement addressing the seeming divergence of interest is usually addressed primarily in what’s referred to as Major Decisions Clause, where basically the JV agreement gives the operating member the right and the responsibility to handle the daily operations, but there will be a specific list of actions that that operator cannot take unless it gets requisite approval from the investor. Now, the scope of that list is going to vary depending on the parties and the deal. If you have a very hands-off investor that has a lot of confidence in the operator, that list is going to be shorter. If you have a less comfortable investor, more hands-on investor or even an investor who by its own business strategy has some limitations and has some obligations that it might have to its investors over control, then that list is going to be longer. Things that are typically going to be in that list, but again it’s all negotiable, is selling the assets or the property that the JV owns, buying assets, financing or refinancing, dissolving the JV, approving business plans and budgets, which is a very significant issue for an investor, because that’s where the money is getting spent; similarly with major capital improvements. From that sort of starting off point, there’s the investor wanting greater control is going to be looking at approval of leases and contracts, proving property management agreements, spending money in excess of the approved budget, how much can the operator spend before it needs the investor’s approval, making elective distributions, calling for capital, issues relating to litigation and engaging counsel or engaging accountants, dealing with reserves that aren’t specified in a budget, modifying insurance requirements, removing key personnel, the list could go on and on, it really is just dependent on how much control the investor feels like it needs, wants or is obligated to get, given its own business structure. Jill Blumberg: Yeah. And Craig, I think that one of the other areas where balance is so important and which can get a little bit tricky is when you are talking about both the capital contributions and the distributions provisions in these JV agreements. I mean ultimately these JV agreements are formed for people to make money. So when you are talking about the amount of money that the parties are bringing to the table and then the amount of money that they are getting paid out, that can get — it can be very delicate and they can include a lot of lengthy negotiations because in this area the parties’ interests are not necessarily aligned. With respect to capital contributions, when you are talking about sort of an investor versus the operating member, it’s extremely important for an investor to perform due diligence on a potential partner before entering into a deal. I think one of the things as we were talking about earlier, why JV agreements can be so complicated is that they are very often long-term transactions. I think as Brenda had mentioned. And as we have seen in recent years, there’s upturns, there’s downturns and these JV agreements really have to weather the storm of all of the market ups and downs. Particularly, when you are talking about development deals, where the parties may be required to put in additional capital as the deal goes on, an investor doing due diligence on the operating member that it’s choosing is extremely important. In almost all of these cases the investor member is typically going to argue that the money that they put in is all the money — at the beginning is all the money that they are putting in and that the operator should really be responsible for any required additional capital, because the operator is the member who is in charge of controlling the budget, and monitoring the construction, and making sure that there aren’t any cost overruns. And for this reason the investor typically wants to ensure that its partner has the necessary liquidity to invest more capital, to get the project completion if in fact the project does run into cost overruns or if the budget does go a little bit astray. But then you sort of have to balance that against the fact that often developers are running multiple projects, with multiple partners, and a lot of times these developers run their businesses very lean, so they may not have available capital. So for this reason the investors really need to keep a close eye on the budgets and the cost. And this sort of ties back into what Lori was talking about, as far as management and major decisions and how an operating member might not want the investor to have to approve every single line item on a budget or every single time a line item goes over, but for an investor who is bringing millions and millions of dollars to a project and is likely not going to want to put any more money in, it’s really important that they keep an eye on these things. I know that there was one deal I did right before the downturn where it was a development deal and the project had cost overruns. And at the beginning of the deal we didn’t as clearly negotiate as we needed to what member was responsible for paying those cost overruns. So now you are at a point where you have a project that’s half built, you need more money and the parties kind of look at each other and say, well, what do we do and the investor member says, I am not putting in any more money, and the operator says, well, I don’t have any money to put in. And nine times out of ten what’s going to happen, the investor is going to have to come up with the money, because no one wants a project to lay dormant. Now you also have a lender that’s looking and saying, hey, we are on a timeline, when is this project going to get done. So again, if these types of things aren’t negotiated at the beginning, it can become a real problem for both parties. Sort of talking very quickly about distributions, that’s another — it can be another pain point for the parties when negotiating. Typically, operating members who don’t bring as much equity to the table at the beginning of a deal, they want to negotiate a strong promote and a promote is essentially a profits interest, that’s typically significantly greater than the operating member’s equity interest. So disputes can arise between the parties as to when the promote is paid. Is it paid upon a capital event or is it paid quarterly but only after the investor receives all of its accrued preferred return. These types of things are often heavily negotiated. Negotiations could also include whether the operating member receives catch-up distributions once a certain trigger is met. So in this instance the investor member wants to ensure that it gets as much profit out of the property as possible before the operating member starts to receive its promote interest. On the other hand, the operating member is going to argue, well, the property is only going to become profitable and only does become profitable due to my expertise and my involvement, and therefore I should start to realize my promote profit sooner rather than later. So you can see that even in something that can sort of seemingly be as simple as who is bringing the money to the table and when the parties are getting their money out, there are layers and layers of complexities that the parties have to work through and really need to work through at the beginning as to avoid complications down the line. Brenda Cooper: Right, and another way that the parties balance their rights and their interests is for the operating member to be compensated by paying fees to its affiliates for their services. In addition to paying the operating member a promote, the operating member often has affiliated companies that provide various services for the property, such as property management, development or leasing services, and those fees are paid pursuant to affiliated contracts and they are paid currently during the operation of the property; whereas, the promote is often not paid until the property is sold or refinanced. So these fees are a key part of the compensation that the operating member is paid for its real estate expertise and the services it provides. And a cautionary tale that I can tell from my practice that relates to the alignment of interests or misalignment of interests I should say is I was involved in a programmatic joint venture, where the parties entered into the JV with the intent to develop, stabilize, and sell properties all across the US, but due to the recession they had to hold the properties longer than they intended. And during the whole period the operating member’s affiliate was managing the properties and earning these management fees. So they in the end didn’t really have as much of an incentive to sell the properties because the market was depressed and they were not going to receive a promote on sale because the sale prices would not generate any promote for them. So the parties did not have the same interest. The investor member wanted to sell to get back its investment, plus whatever preferred return it could, whereas the operating member was happy to just keep operating them and receive its fees. And the investor member did not have the right to force the sale under the terms of the JV agreement and didn’t have another attractive exit option at the time. So they ended up in a stalemate for quite a while before they ended up working out a resolution. So that’s just one example of how they went into the JV, initially with the same interest and the same investment strategy, but because of a change in the market over time, it was an unforeseen circumstance and they ended up in a stalemate and had to negotiate to come up with an acceptable resolution, but it took quite a long time and they were at odds for a long period of time during the term of the JV. Craig Vaughn: So it sounds like you wear a lot of hats, one minute you are a financial advisor, the next you are a real estate developer giving lots of different advice to lots of different types of parties. You might be part marriage counselor, right? I am imagining you might have to give some of your parties a hug one minute or put on your Dr. Phil hat and grab them behind the ears and pull them into the room just to kind of work things out. So to me it almost sounds like you are making the case like, this is such a bespoke practice that if there was an online resource that could keep folks up to date, it almost seems like you are making the case against that, but you took your combined 45 years of practice and recently developed a Real Estate Joint Adventure Toolkit, how could you possibly form a strategy on how to execute such a complicated thing to publish? Jill Blumberg: Well, I will tell you Craig — well, first of all, you are completely right that I think a lot of times real estate attorneys, particularly when they are negotiating JV agreements wear a lot of different hats; lawyer, business advisor, absolutely marriage counselor, sometimes divorce attorney, we wear a lot of hats. And yeah, I would say that while we — we all really with all of our prior experience in practice we realized that there was this real gap at the market for a product that would directly address some of the greatest pain points that real estate attorneys experience when drafting these types of agreements. And to give you a sense of how complicated these agreements can be, when we were sort of brainstorming and trying to figure out the best product that could address this gap, from start to finish it took us about 18 months to publish this product. We think it’s an unbelievable product and that it really is going to fill this gap in the market, but part of the problem is that we realized as we all sat down to talk about really what could help real estate attorneys is that there is absolutely not a one-size-fits-all model for this type of agreement. So we knew that like we couldn’t just publish a form of LLC operating agreement and send it out to the world and that it would be helpful to all people, it wouldn’t be. We realized that the most important thing that we needed to address and focus on was the fact that these agreements are highly business-driven. I think one of the reasons that joint venture agreements can get so complicated, even from a legal perspective, is that you really have to understand your client’s business motivations, you have to understand their investment strategies, you have to be really tapped into what’s going on in the market, because all of those things will influence how you draft and negotiate these agreements. So given all of that background we decided to create, as you said, a bespoke product for a bespoke practice. So what we did is we created a set of plug-and-play clauses, standard clauses that all work seamlessly within the framework of an LLC operating agreement. That LLC operating agreement is included in the toolkit, it’s long, it’s complicated, it has everything that you could possibly need in it, but it’s only one version. For some of the more negotiated clauses, we have included in that standalone LLC operating agreement sort of one of the most basic clauses for each of those — sort of each of those areas. So for management we have an example of a pretty basic management clause. For capital contributions and distributions we have again a pretty basic clause for those. But what we have published in addition to that standalone agreement is a set of, I want to say approximately 30 standalone standard clauses that you can plug, you could delete the clause that’s there, and plug this one in, and these are very business specific, business-driven clauses. So you can kind of take a look at what’s offered, see what your client and your client’s partners have agreed to on the business side and really pick the clause that best fits your business transaction. Because we all had so many years of experience we really I think took that expertise and curated these standard clauses that would fit the most common business terms and the most common sort of business deals that you see out there. What was really important to us is that we wanted to give our subscribers the ability to be able to customize the document to fit the business terms of their transaction. We wanted to make it as easy as possible, so every standard clause seamlessly works with every other standard clause. All of the defined terms are there and work with each other. You don’t have to worry about sort of checking and double checking and cross-referencing your defined terms, they all work together. And then in addition to all of those standard clauses and the standalone agreement, we also include comprehensive resources that provide what practical law is known for, our know-how guidance on tax issues, on structuring the deal, on management structures generally, on capital contributions and many more topics. So while it may seem that this sort of tool is really geared towards only those very experienced attorneys or sophisticated practitioners, we have a lot of guidance, we have a lot of resources for people who might not be as experienced, and why that’s important is because in this day and age in the legal world efficiency is key. Being able to collect on your billables is key, not having write-offs. So for us we wanted to be able to sort of give access to maybe someone who doesn’t do this on a day-to-day basis, but give them access to a product that can help them expand their business, can help them expand their practice, can really introduce them to maybe a different side of the real estate world that they haven’t gotten into thus far. So I think it works for people at large law firms, it works for people in small law firms, it certainly works for in-house counsel. We have really thought about it from a 360 degree sort of viewpoint, and I think we have created something that really fills this need. Craig Vaughn: So Jill, it sounds like you took a very sympathetic strategy to this whole thing, the way that you have isolated all these different clauses, all the different building blocks that go into this type of agreement, and I am able to zig or zag or put them where I need to be and everything is going to line up in the end. So that makes a lot of sense. And it also sounds like if I do get a chance to use one of my previous work products, it seems like it would be very complementary to that as well. So thank you all very much. I might entertain exploring a career path towards real estate joint ventures now that I know there’s a great online resource out there. So I would like to thank all of our distinguished guests for their participation today. If you liked what you heard today, please rate us in Apple Podcast. We will see you next time for another episode of Down the Hall with Practical Law on Legal Talk Network. Outro: If you would like more information about today’s show, please visit HYPERLINK “legaltalknetwork.com” legaltalknetwork.com. Subscribe via iTunes and RSS. Find both Thomson Reuters: Practical Law and Legal Talk Network on Twitter, Facebook, and LinkedIn or download the free app from Legal Talk Network in Google Play and iTunes. The views expressed by the participants of this program are their own and do not represent the views of, nor are they endorsed by Thomson Reuters, Legal Talk Network or their respective officers, directors, employees, agents, representatives, shareholders, or subsidiaries. None of the content should be considered legal advice. As always, consult a lawyer. No legalese, just expertise on trending legal topics. Kelly Brennan talks about the new laws and regulations that empower financial institutions. In this legal podcast, Kelly Griffith talks about the relevance of e-discovery and how it has changed since she entered the industry. This legal podcast covers what IPOs are, their future market, and how lawyers are involved. Janelle Wrigley discusses how to safely navigate the gray areas relating to interacting with competitors and gathering competitive information.